Anchored in shallow, cloudy waters just a few hundred yards from the mangrove swamps that dominate this wild and empty coastline, the fishermen rolled in their nets. The three men had spent five days at sea and their catch glittered on the deck. Not all fishermen share his concerns. As he manoeuvred his tiny boat to a waterside gas station in Oiapoque, the nearest town, Maxibreno de Nazaré, 20, said drilling would mean a ready supply of cheaper fuel, not realising that crude oil would be refined elsewhere. The 2,500-sq mile (6,500 sq km) Cabo Orange national park where Celeiro was fishing is home to protected species such as the Amazon manatee and the small-tooth sawfish. An enormous coral reef system was only recently confirmed near drilling areas and filmed and photographed for the first time this year by a Greenpeace boat. Plankton in the seas the companies plan to drill in absorb huge quantities of carbon dioxide, helping reduce global warming. Even BP admits that in the short-term “exploration phase”, the benefits for Oiapoque will be minimal: they renovated the airport and will pay local taxes, but that’s it. But for oil companies, the lure of this basin and its estimated 15.6bn barrels of oil is powerful. Geologists and oil executives compare its geology to that found off the coasts of oil-producing nations such as Nigeria, directly across the Atlantic. Exxon has made major oil finds in Guyana, just up the coast. And as the global oil price slowly recovers from a three-year slump, Brazil has become a hotspot. The state-run oil company Petrobras is producing record volumes from the vast, ultra-deep reserves found off the country’s south-east coast. These deposits are known as pre-salt, as they lie beneath a thick layer of salt within the earth. In October, Total and BP bought shares in new pre-salt areas, but that has not dampened BP’s appetite for exploration off Oiapoque, a senior executive told the Guardian. During a six-hour boat trip to the Cabo Orange park, warden Ricardo Motta Pires said an oil leak would be catastrophic for its mangrove swamps, which flood in daily tides and would be impossible to clean. He described how pieces of a rocket fired from French Guiana had ended up in the mangroves, showing how ocean waters reached them. At a public hearing the next day in Oiapoque, BP technicians said their computer modelling showed that in the event of a leak, oil would have a 0% chance of reaching the coast and an 8.3% chance of reaching the coral reefs – described by scientists as a whole new ecosystem, with 29 new species of sponge alone. Instead, they said, an oil slick would head north. “The exploration activity generates negative impacts but they are small and do not last long,” Décio Maia, operations manager of the Aecom environmental consulting outfit hired by BP, told the hearing. Greenpeace disagrees, and has presented Ibama with a critical analysis of the modelling used. “The evaluation found some gaps and oversights in the way the models were implemented and validated,” Greenpeace said. "Oil executives compare the reef's geology to that found off the coasts of oil-producing nations such as Nigeria, directly across the Atlantic"
Greenpeace analysis of Total’s environmental licence application found that the company calculated up to a 30% risk of oil reaching the reef in the event of a leak. One of Total’s planned wells is just 28km from the reefs. During hearings, BP officials explained they sought a licence for five months of exploration work involving one drill-ship. If the company did find oil, a whole new licensing procedure would be required before extraction. 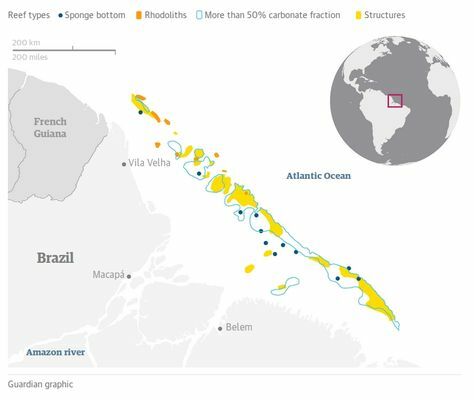 When asked by the Guardian how they could ensure there would be no damage to the coral reef, which has barely been studied, technician Paula Castellões said the reef system was in shallower water than the planned oil well and was being monitored. “Care is being taken that direct operational impacts don’t occur,” she said. BP declined interview requests and did not reply to emailed questions. In March, Britain’s trade minister Greg Hands met Paulo Pedrosa, Brazil’s deputy minister for mines and energy, and raised the concerns of UK-based oil firms Shell, BP and Premier Oil over “taxation and environmental licensing”, according to a British diplomatic cable released by Greenpeace. The environmental licensing applications Total and BP presented have run into problems. In August, Ibama sent Total’s application back for more work, warning that this was the third and last chance the company had to get it right. In November Ibama also sent BP’s application back and requested more analysis. At another BP hearing in state capital Macapá, Elane Cunha, a researcher at the Amapá State Scientific and Technical Research Institute who contributed to BP’s studies, criticised the firm’s environmental impact report. She said the report, which BP distributed at hearings, downplayed the impact an oil leak could have on plankton in the area which plays an important role in absorbing carbon dioxide. Studies have found the plankton is highly productive because it is fed by nutrients from the Amazon river plume. For many residents in Oiapoque, information has become as clouded as the waters. Locals hope for jobs and improvements to the city’s creaky infrastructure. “It’s a good idea; it will bring jobs for everyone,” said Alenilson Maciel, 43, a labourer who lives beside a rickety wooden road bridge. In fact, BP plans to use a base in Belém, 450 miles away, during exploration, using Oiapoque only as a stop-off for crew flights. The mayor of Oiapoque, Maria Garcia, asked BP Brasil’s CEO Adriano Bastos, who was in town for the hearing, for help improving sanitation, housing and roads. “I want to see a model city,” she said. Her planning secretary, Igor Garcia, who is also her son, said BP had turned down the town’s demand for three pickups and two cars. For many years Oiapoque suffered from illegal gold mining and dredging from “garimpeiros”, as the miners are called, until the gold ran out and they moved operations further into the forest, according to a former miner Ronilson da Silva, 58, who now runs a guest house. Unlike Oiapoque, a 10-hour bus journey from Macapá, much on dirt roads through forests, Rio de Janeiro has an established oil industry. Its state government depended heavily on oil taxes and was hit hard when oil prices tumbled. While it struggles to pay salaries, its former governor Sérgio Cabral languishes in jail after being convicted of crimes including corruption and money laundering. Others worry that even rumours of an oil boom will send people rushing into Oiapoque, causing rural slums to grow up and crime to soar, as has happened near other Amazon developments such as the Belo Monte hydroelectric plant. “There will be a big problems with security,” said Priscila Barbosa, 28, a teacher from the local Karipuna indigenous tribe. Even so, Amapá state government officials said they supported plans to drill for oil and even floated the idea of building a refinery to process it.